Marine equipment and engineering services provider Okeanus Science & Technology (Okeanus) delivered of two Okeanus Model DT3030EHLWR winch systems to the Colombian Navy for magnetometer deployments. The Model DT3030EHLWR winch is a general purpose, highly transportable winch designed for a wide variety of oceanographic applications such as sub-bottom profiling, side scan sonar, CTD or other similar operations. Each of the two fully integrated systems features a gearbox-hydraulic motor drive, primary automatic fail safe brake, secondary manual band brake, automatic bi-directional level wind, and local/remote control stations providing infinitely variable speed control. Both winches are equipped with lifting eyes for four-point lifting; sea fastening plates to allow rapid installation and removal aboard vessels of opportunity. Each winch assembly provides a bare drum safe working load of 16,013 N (1,633 kg, 3,600 lbs) at a bare drum line speed of 1.00 m/s (60 mpm, 200 fpm). 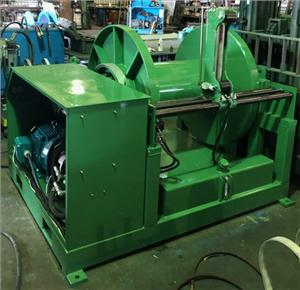 The winch drum is capable of holding 5,000 meters (16,405 feet) of 11.43 mm (0.45 in) outside diameter cable. Overall dimensions are 1,473 mm (58 in) depth, 1,930 mm (76 in) width across the drum face and 1,473 mm (58 in) height. Each winch is equipped with a 22 kW (30 HP) electro-hydraulic power unit integrated into the winch base frame.